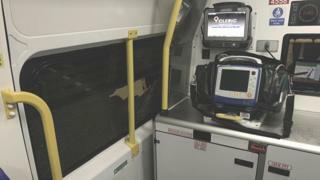 An ambulance window was smashed as paramedics were on a 999 call. They had been called to a patient with breathing difficulties when the vehicle was attacked in Castle Bromwich on Thursday. West Midlands Ambulance Service officials questioned "why on earth somebody would want to do this", calling the attack "despicable". No-one was hurt but crews said it was "incredibly frustrating" and repairs could cost "hundreds". Image caption The ambulance service said repairing the vehicle will cost "hundreds"
The attack happened at about 20:50 GMT in Collector Road. The damage meant another ambulance had to be called out to deal with the emergency call as the first had to be taken off the road. "Whoever did this could clearly see it was responding to an emergency," Nathan Hudson, from the ambulance service, said. "What if it had been on the way to one of their family members or rushing a loved one to hospital?" He said CCTV from the ambulance was being handed to West Midlands Police and appealed to witnesses to contact the force.